I normally try to stay far AWAY from political posts. Insanely far away. But I don’t know what it is. Maybe it’s the trip I’ve got booked next month to go speak at the UN on behalf of raising a child with Down syndrome to policy makers and diplomats abroad. Maybe it’s the fact that it’s Addison’s birthday week and just vividly remembering the trauma of her pregnancy and first months. Or maybe it’s the kicks and squirms and rolls that this new baby constantly delivers to remind me of her presence. The news these days is making me want to say things. First New York passed their new law about abortions until birth. Then, just as we were smugly patting ourselves on the back that at LEAST OUR STATE didn’t do that, Vermont came out with an even more permissive law. Here’s the deal. Sharing this is not going to make me popular. In fact, I know that some of my friends strongly disagree with me. I am not here to change anyone’s mind or judge anyone. I am simply speaking my story out loud. Because I was once one of those moms. The one who got handed “bad news” from a genetics counselor who consoled me as if my baby had already died. And then asked if I was ready to discuss “my options”. Here’s the deal. The God’s honest truth that’s difficult to even say out loud. At the time I was a scared, first time, young mom who really did want to be able to consider these options. I wanted this problem to go away. I wanted the happy, normal life I had before to return. I didn’t want a baby with a diagnosis. I wanted to start over with a new pregnancy. A new chromosome count. I wanted a ginormous eraser to just undo the genetic counselor’s stupid phone call and the diagnosis and the thing growing inside me that apparently was my deformed child. I was mad. I was angry. I was terrified. 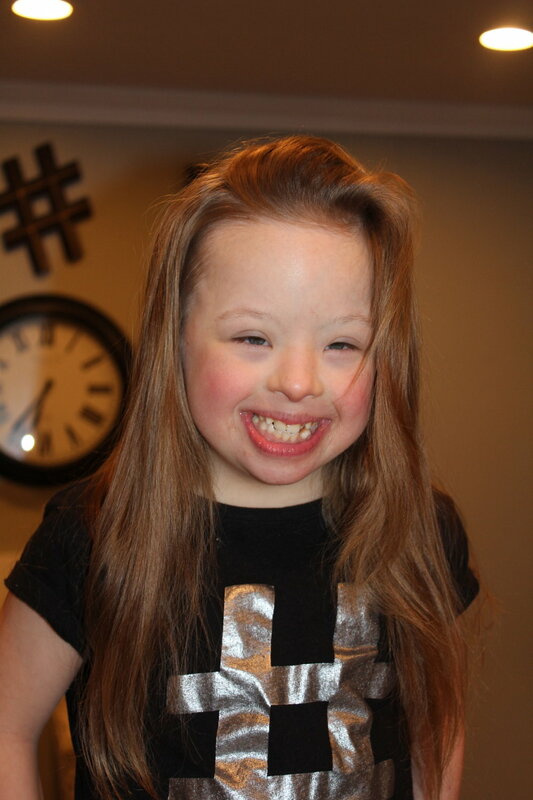 I didn’t want any part of raising a child with Down syndrome. It would ruin our family. My entire life. Happiness was gone forever. My life would constantly be marked in two eras, the one before the call and the one after. When I got the diagnosis, I was 19 weeks. I was well within the window to be able to legally discuss and pursue “these options”. But I just couldn’t. While inside my emotions and thoughts were a dark swirly mess, outside I…just.couldn’t. And so I wrestled through the entire pregnancy. Angry. Terrified. Scared. I would pray for the tests to be wrong. And then I would have these dreams where she was born and in her little hospital isolette and I took one look at her and just walked away because I couldn’t love her. I would wake up in a cold sweat and then say “it’s just a dream!” before remembering that the biggest nightmare of my life was just beginning. And turns out, there was no nightmare. Just misinformation. Looking back at my fear, my anger, my shaking my fist toward God. I can see a much bigger picture. Pieces fall into place with my 20/20 hindsight. Difficult paths that seemed impossible were just carefully hewn growth paths designed just for me. As I stood at the bottom of the mountain looking up, all I could see were the tangled weeds and disaster zones. But now I stand at the top of the mountain looking down, and let me tell you, the view is magnificent. If I had given in to the fear, I would have missed out on one of the greatest experiences of my life. Because I learned that my fear was ignorance about a diagnosis. My anger was from a little girl struggling into womanhood who needed to grow up and realize that motherhood was not about her. Being Addison’s mother has been joy upon joy. Have there been hard times? Yup. But there have been equally as hard times parenting my other kids. Just different. I learn different things from each of them because once again…God has sent me exactly the kids, exactly the parenting experiences that He wanted me to have. Are these experiences always fair? But He is fair. And I trust his plan and that in goodness and kindness that he designed in it. And no, I don’t believe he gives us only what we can handle. Because I totally can’t handle being a mom to 5 kids. I believe he sends us what we can’t handle. And then he equips us to make it through. More than make it through. To thrive. To find joy in impossible situations. To find happiness and beauty in unexpected places. If I had pursued my legal options, I would have missed out. It would have been the biggest regret of my life. “Getting rid of” a growth opportunity that God had sent me would have seemed easier in the moment, but unknowingly erased a million blessings that he had packaged into that entire situation. A diagnosis should not be a death sentence. This isn’t about you. It’s about the human being with a beating heart inside of you. And this is where I talk about being almost 30 weeks pregnant and feeling this little girl nestling around inside of me. This is a person. I can feel her living her best life in there, working hard to grow strong and be given a chance on the outside world. And I bet you anything. Growing up with a sister with a disability will teach her a lot of things that school can’t. Things like worth. Acceptance. Achievement. And love. Don’t play God. Don’t assume you know better because a genetics counselor hands you a diagnosis. I’m tired of reading the million articles on how we just don’t understand the stories. You’re right. I don’t. But I do understand one thing. We don’t know what it’s like to parent our baby-in-womb until we actually parent them. Stop listening to the fear-mongers and the lawmakers pushing the boundaries on this concept (who just need to shut up and go home). God created your baby. He designed him/her perfectly. Give your baby the chance to change the world. Starting with you.